Every wondered what NAIDOC stands for? Or what NAIDOC resource to use to decorate your school or office? 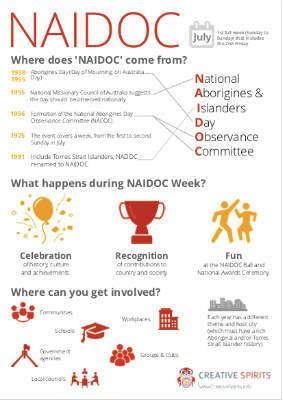 Use this infographic to help your students and colleagues understand what NAIDOC is about. the history from 1938 to 1991 (from origins to present form). Unique to this poster is the approach to explain NAIDOC history via references to each word of the acronym. Easy to print and put up. Use it for classroom activities or presentations.